In a recent post about the Steingruebl World Enterprises avian associate, I introduced a poll pertaining to parrot gender issues. Beaker has always been referred to as male by us here at SWE. However, there's no good reason for that other than we were just in that sort of a mood. Every vet and vet tech who's ever seen Beaker has exclaimed, "Oh, isn't she just a sweet little one!" Given that and Beaker's profound interest in Andy (parrots are known for their hetero attractions to people), it would be much more reasonable to call Beaker a girl. Of course, we could settle this once and for all with some exploratory surgery, but Steingruebl World Enterprises has some strict policies against such things. So, on the front page we have a poll. Alert reader and sister-in-law Roni has pointed out another excellent option which has now been added for your voting pleasure. Time to practice for November, people! Head for our main page and vote. And, if you're so inclined, talk to Google about adding Instant Runoff Voting to their little polls widget. Or write one yourself and I'll use it in my next opinion poll. You know, my English teacher beat it into my brain that a being of unknown gender is a 'he' until such time that the gender is certain. So grammatically at least, 'he' is correct. What does Beaker say? I can see an array of 'he' and 'she' tiles and seeing how many the bird picks up. How about a low tech and old fashioned test. 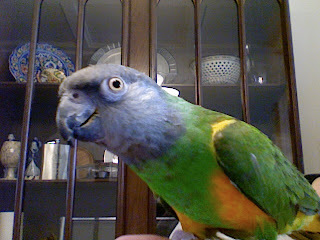 I'm talking a brief fling - no commitment - with a friendly, certified, boy parrot. If there are little parrotlets you can sell them for a FORTUNE!